1 Apples are a yummy treat, but how much do you really know about apples? The apple gets its name from the Latin word pomum, meaning fruit in English. It is classified as a pome, which is a fruit that has many tiny seeds within a core at the center. 2 Wild apples, often called crab apples, have existed for thousands of years. These wild apples were small, rather sour apples full of seeds. 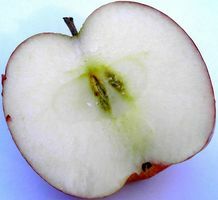 People have worked to improve the apple's taste since its discovery. Apples have been associated with love, beauty, luck, health, comfort, pleasure, wisdom, and temptation. In Greek mythology, Mother Earth gave a tree with golden apples to Zeus and his bride Hera on their wedding day. The apple tree was guarded in the garden of Hesrperides by a serpent that never slept. 3 The actual origin of the apple is unclear. Historians believe apples were first planted and grown as a crop in southwest and central Asia. A tablet was found in northern Mesopotamia in 1500 B.C. that recorded the sale of an apple orchard for the price of three prized sheep. Historians believe it was the early Romans who learned how to cultivate apples. Cultivation is the planting of seeds or roots to grow a crop. Farmers began learning how to grow sweeter, juicer, and firmer apples during the Greek and Roman Empires. 4 Cicero urged his Roman countrymen in 50 B.C. to save their apple seeds from their desserts for planting. In 79 A.D., Roman statesman Pliny the Elder recorded more than twenty varieties of apples in his natural history encyclopedia. Greek physicians recommended sweet apples with meals as aids to digestion in 200 A.D.
5 The Greeks believed the apple represented love and beauty. It is said they believed that tossing an apple to a girl was the same as a marriage proposal. The custom of bobbing for apples was a British custom that was adopted by the Romans after they invaded Britain. The apples were floated in a tub of water. Young, unmarried people would bend down and try to bite into an apple without using their hands. The Romans believed the first person who came up with an apple would be the first to marry in the coming year.